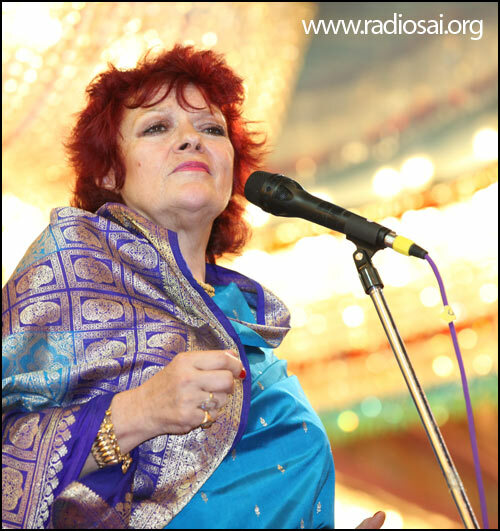 Ms. Dana Gillespie is a musician of international repute, who has emerged as an ambassador of Sai message around the world. In this interview, she explains how she takes her music to remote places to share Sai love with diverse groups and in the end, comes back home realizing how little she knows of her enigmatic Sai. This British singer, actress, and song writer and blues diva has been performing in the Divine Presence of Bhagawan Baba since the past 16 years. Her first performance in Prashanti Nilayam was at the time of Baba’s 70th birthday. She has 46 years of music background with over 61 albums to her credit. Her career has combined her music with radio, theatre, film, and sports. Although her life has become synonymous with her music, in the 1970s, she became well known for her appearances in London’s West End theatres. She played the original Mary Magdalene in the first London production of Andrew Lloyd Webber and Tim Rice’s Jesus Christ Superstar. The versatile Dana who seems to have been there and done it all things creative comes from a family of do-gooders and social activists. Her family was attached to the Church of England. Her ancestors were Quakers and included Elizabeth Fry of the prison reform fame. Yet, this trailblazer foresaw her personal journey as a musician early in life, a journey that has seen her share the stage with the likes of Bob Dylan and Mick Jagger, among others, and entertain audiences all over the world. 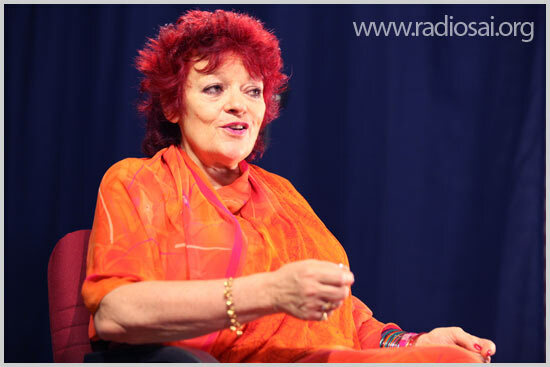 Presented below are select excerpts from a conversation recorded between Dana Gillespie and Radio Sai's Karuna Munshi in March 2011 at the Radio Sai studio. Radio Sai (RS): Sairam Dana, and welcome to Radio Sai! Dana Gillespie (DG): Sairam Karuna, and a pleasure to be here! RS: As a young girl of 11, you told your parents that you wanted to change your name and you chose your name — Dana. Where was that coming from? And it flows very nicely off the tongue. RS: But, at 11, how did you know that you were going to be famous? DG: I’ve always functioned on the instinct side. Musicians have to. I just knew that music was the thing for me. I was a very normal child. I was interested in chocolate and animals and music, and that was about it. And so, I just followed my dreams. The first blues song I heard was when I was 11. I didn’t understand a lot of the lyrics but I used to sing along to them. And I felt this music very intensely. And you know, blues music is something that is very simple and I think that if one can talk about reincarnation, I must have lived in that era. The moment I heard Ms. Bessie Smith sing and she was the heroine, the icon of the old blues women in the ’30s and ’40s, I felt I had come home. And in the ’60s, blues was very important as a lot of the bands that we might know now like The Beatles and The Rolling Stones, they started out as blues bands because it’s basically 3 chords and 12 bars. It’s music that is born out of pain. Anything that is done without having to read notes like classical music where you’ve got to read, it has to come from the heart. So all the blues musicians I work with, they work from the heart; they do not work from the head. 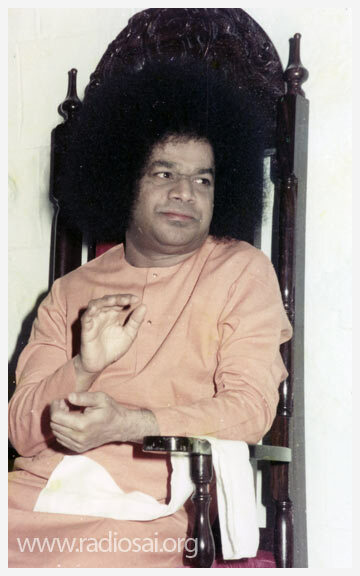 If you’re sitting in a bhajan group and it’s your turn to sing, I always go “Oh Swami, please help me get the right note” and hope that He gives me, because if you start too low or too high, the bhajan is ruined as you then land up in a squeak or can’t find the deep note. So, you have to function on instinct. And bhajans plays a large part of my life. RS: You’ve had quite a journey as a musician. You released your first album at the age of 15 and it was folk music. And the many genres of music you have traversed through could not have been possible without a personal journey, because as an artist, you’re intensely involved in your work. You write most of the songs you sing yourself. Tell us about this journey, about the evolution of Dana Gillespie. DG: Well, I suppose musically, I started as a folk singer because I couldn’t afford a band. And I wasn’t even allowed to be in the school choir as I was far too much of a giggler. I knew I had an okay voice and I knew that this is what I wanted to do. I wasn’t sure whether it would be theatre or film or anything. I just knew I was meant to perform. So, I took any job that came my way and I really did some awful musicals and some pretty terrible old films. At 15 I was a sports girl for four years and was in the snow ski team as well, until an avalanche swept me down and damaged my leg. Hence, I often walk with a limp. Then sports got the backseat and also, I realized very early on that you didn’t make money out of sport and I’ll have to survive. I lived at home until I was 30, which is very late for anyone. DG: Yes, it is. It’s extremely odd but I had such a good relationship with my parents and so, I just lived in the basement flat. I had a piano and a drum kit and a bass guitar and a little kind of a sound recording. They had two tracks to record, which was quite revolutionary then and musicians used to drop by and so, a lot of them were… are famous now, but then, they were just sessional musicians. They weren’t famous to me. DG: Well, David Bowie used to walk me home from school and carry my ballet shoes when I was 14. Jimmy Page is still an old friend who’s founded Led Zeppelin. He played, he produced a track on my first album as you said when I was 15. So, these guys were just normal guys. They then stuck to their music and became more famous. I left regular school at 15, and went to a theatre school, because I was working in the evenings, raising money to afford a drum kit and drum lessons in a record store. And in the mornings, between 5 and 6.30, I was delivering newspapers so I could get enough money to buy this drum kit. So I formed a band when I was at the theatre school; I was 14 then. I was the drummer, of course. And on one of our first big gigs, the singer was ill; didn’t even bother to turn up. And I knew the songs. We got another drummer and then I became the singer. DG: Well, yeah, but then is anything by chance, really? So, I knew I couldn’t really be a drummer because my drum teacher was an extraordinary man called Buddy Rich, and he would take me to see this world-class drummer. And when I saw how this man played, I realized I could never play like that. And I’ve always worked on the premise that if you can’t do something really well or be the best, then do something else. I was doing, as I said, terrible musicals, weird films, and nothing really that my mother would have ever been proud of. And this is the yardstick in my life – would my mother like something – because I had an amazing mother. She used to come here to see Sai Baba as well even at the age of 84. Anyway, the moment I landed a role in Jesus Christ Superstar, she was able to go “Ha! My daughter did something valid and great!” And that sort of changed my life in a way. And the week before the show opened, they asked me if I’d sing to try out for the understudy. In those days we used to get two pounds extra in the understudy. But I thought, “Well, ok, maybe, my dream will come true.” And I went. They called me back to come in the next day at nine in the morning to sing the main song which is “I dunno how to love Him”. And something happened to me, something took over my body. I stepped out in front of the biggest theatre in London and took the microphone. I’d never sung this song before, I had to learn it the night before because Mary sings alone on the stage. The chorus do all the dancing, leaping about. And as I started to sing, I can honestly say, I had almost like a God-like experience. Something sang through me. It was amazing. I’m not saying this pigheaded. I came on stage with tears in my eyes, with my knees shaking, because I’d never heard my voice alone with a piano in a huge theatre. And I waited for half an hour in a little room in the side. And the director comes in and says, “We’re going to make you Mary. We’re gonna have to buy out the other girl”, who was bought out. And I took over the role. And it was an amazing experience. But the show was a hit and my mother was proud of me. I was the talk of the town. But that wasn’t satisfying for me because you’re doing something that somebody else has written. I knew I’m meant to sing what I’m feeling. So when it was over, I went to America and started touring there. Then, I had my band. So I just kept recording from there. RS: And you’ve had a hand in radio as well, from Austria, Vienna? DG: Yes. Now, that was one of the joys of my life. It was called ‘Globetrotting with Gillespie’ and it ran for 11 years and I specialized in Indian, African, Arabic, and blues music. Nobody else was doing it then across Europe every Saturday night. So every taxi driver in Vienna knew me and my voice because they were all foreigners. And so, I played something from the Ivory Coast one day or a bhajan. I used to sneak the odd bhajan in, which made me rather happy. I actually thank God for that experience, because if you can understand other countries’ music, then you can understand the people better. And when you understand the people better, there’s no need to have wars and fights with them. I’m a great believer in pacifism. It’s so important, this understanding that we are all one. And music is the great communicator and I know that because 35 years ago, I was sitting on a camel in Jaisalmer, Rajasthan when I went to one of these camel safaris with the camel man who did not speak one word of common language. So he started sort of humming and I had just learnt a Pankaj Udhas song. So, I sang this to him. He immediately perked up. He recognized the melodies. So, he sang a song, I sang a song. We spent the next 8 hours singing songs. So, we were friends and he taught me about the power of music. RS: Dana, as an artist, you’ve lived a full and exciting life. Now, where does the chapter on Sai Baba fit into the life story of Dana Gillespie? DG: When I first read a book on Sai Baba, which was ‘Man of Miracles’, it was about 31 years ago, then I did something I never do. I instantly went to get a ticket. Actually, my father bought it for me. He said, “I have a feeling you’re meant to do this.” So three weeks later, I leap on a plane and head to India. I had this feeling that Sai Baba was going to say when I got here, “Hello! I’ve been waiting for you. You are the chosen one.” But of course, not a bit of it. He ignored me for 12 years. I slept in the sheds, got eaten alive by mosquitoes, had extraordinary experiences, coincidences, things that a non-believer will go, “Well, that’s just a coincidence!” But you know, when you have Baba in your heart and you have faith, then you realize that nothing is a coincidence. I had quite a few unusual experiences. And they were enough to keep me coming back sometimes twice a year to sit and be crushed at the back. My leg was bad. So, the first time I came here, I actually walked into the place and left in a wheelchair instead of being the other way around, because I was determined to sit cross-legged. It was agony. And I often have walked using a walking stick when I’ve been here. I don’t mind. It’s just the body. I’m not bothered about it at all. Pain is a nuisance because it drains your energy and it can distract you from getting on with loftier, godlier thoughts. But I have to thank this leg pain because every step I take, which is painful, I have to say ‘Sairam’. Every step going upstairs, I have to hold the railing or find somebody who might be on the step below me and I’ll put my hand on his shoulder and say ‘Sairam! Thank you’. So for that, I’m extremely grateful and I know that Sai Baba has said for every trouble we have, we should thank Him, because that makes us turn to Him more. If I’d have had a ‘bed of roses’ life - a happy husband, and children, and the rest, which doesn’t go actually with the music business, I wouldn’t have wanted to find anything higher. I would’ve been content with the samsaric (worldly) view of life and that has never been my goal. I’ve wanted to fly free. 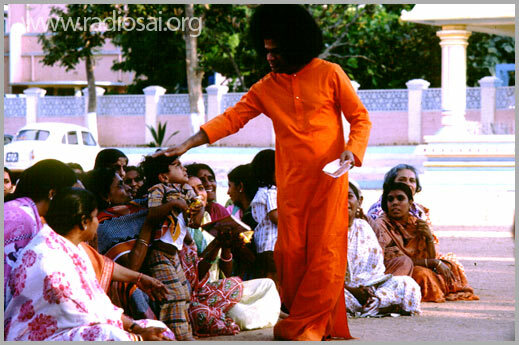 RS: Through these 12 years of anonymity in the ashram, as this westerner with red hair sitting at the back of the Sai Kulwant Hall, with no particular physical attention from Baba, what kept you coming back? Isn't that a fairly long period of waiting? DG: Well, He did little things, small things. One time, I left Bangalore for Puttaparthi and I had lost my passport. So, I thought, well, I’ve read this story about Swami who’s found somebody his traveller’s check or passport in Paris. I thought, “Well, I’ve got a choice – either I go back and they’ll think I’m stupid because I know I haven’t left it there or I go on and He will find it for me and something will happen.” So, I get to Puttaparthi and try and register for a shed accommodation but of course, I get an earful from the men at the accommodation office “How dare you …? Go to the police station!” And to make matters worse, my ticket was also in my passport. I leapt out, ran outside and sat behind the mandir; it was all dark, and I was sitting there, there was nobody around. And then I managed to see, you know, under a bit of a light. It’s 3 o’clock in the morning! I had come out far too early. So I sink down on my knees and I go “Swami, You have to help me.” And I had my hand sitting there. And suddenly, a jasmine flower plopped out of nowhere. There was no wind, there was no jasmine flowers around. It just landed there and I heard this noise, really like a 'plop' as it appeared in existence and landed there. I thought, “My goodness! I know He’s gonna help me.” I had the faith, because I’ve always known everyone else is gonna let me down in life. Only God cannot. He has to be your best friend! So I thought, “Well, I do not know how He’s going to do it but I know He’s going to do it.” And then, at the next darshan, I’m ignored, of course. Well then, I’m a bit disheartened. I’m up there in this cool breeze and I’m watching the eagles flying around. And when I’m up there, I suddenly hear this - like a voice saying, “Go straight down now to the main street. Go now, NOW!” So, I rush down and as I’m going past the accommodation office, a man is coming out with my ticket and passport in his hand. And he’d found it. He tried to return it but because I wasn’t registered, they didn’t know who to give it to. So, we met, and in those days, that street was always very crowded. RS: Did you find out where the man found out your passport and ticket? DG: No, because I looked down to check if it was my name and when I looked up, he was gone. It was one of those great stories! And I’ve got another little one like that. You know, when I first came here, the first thing that hit me about seeing Sai Baba was I must never eat an animal again. Meat is off the menu for me. And I enrolled as a helper at the main cancer hospital, pushing trolleys and I was all trying to do good. And then, my father said, “I think you should go back again.” He had married again. He wanted me to take his wife, my stepmother. We go back and in these 3 days, I’m trying to show her Puttaparthi. Somehow, all the wonderful things that I had wanted to be fell by the wayside. My promises were broken left, right, and center and I felt so miserable that my word was not my bond, to quote Shakespeare. I sat one day in the bhajan hall in Whitefield, actually, in floods of tears. I was about 20 rows back and Swami’s up on the chair and everyone’s happy and He’s beating time with His right hand the whole time. He’s happy and I got my glasses on. So, I can see Him really clearly and I want to sink down low behind the woman in front of me. And my clothes were soaked with tears. I have never cried like that, it was like a tap had been turned on. And I now know when they break a coconut, you know, you’ve got to break the person so that the milk comes out from within. And He looked me straight in the eyes and went once with His left hand and then carried on with His right hand and never moved His left hand again. So, this was very good for me, because it made me realize His omniscience, omnipotence, and omnipresence! I’ve had to learn stage by stage and if He’d have welcomed me that first trip, going, “Yes, here you are! You’re the chosen one!”, I hate to think what my ego would’ve grown to, because I come from a profession where they judge you on your looks, which I’ve always thought was pathetic. I don’t judge anyone on how they look. I look at their heart.